A telescope is one of the best powerful tools that you can own if you are really interested to see beyond the place we live in. However, it would also take a little more skill, enthusiasm, and maybe a little more money on the pocket to have one that is powerful enough to look for those far-off stars and bodies beyond our galaxy. And if you are buying a best telescope for kids, there would be more considerations added on the list: your kid’s enthusiasm about looking for “things”, his adeptness to learn new things, his patience (it would not be very easy at first to learn how to focus and it also depends on the type of telescope you get). At best, make sure that your child has an interest in the use of the telescope. Then consider his skill level at learning to operate new things. It might be good that at first, you consider buying a telescope that is easy to operate (which would not necessarily mean he will be able to see all things he wants to see). If his confidence to operate one is achieved (and this takes a while), then maybe you can consider an upgrade. All right, you were able to assemble the telescope, was able to see through your initial peer at the lenses. Question is, what happens when it is your child’s turn to use it and no one is available to help him tinker with it: will he be able to find his way through things? So your first consideration is the ease with which your child is able to operate the telescope. If he can easily do this, and even if initially he does not see very well, he will be motivated to try harder and find things on his own. Yes, it would be very fancy to have a high tech telescope with all the bells and whistles, but is it really what you need? Remember that the eventual user is your kid so when it comes to the buying decision, you would have to ask him why in the first place he wants a telescope. Maybe, you could consider first buying one that could give a clear view first of the bodies in the solar system-or maybe ask your kid what it is he would like to discover using his telescope. Consider this: you would want to find a telescope that you can easily set up and use: no long hours of setting up and learning how to use. So in this case, just to whet your appetite for the stars, consider one with a big mirror. When talking about telescopes, quality for me is the ability to stand the elements with regular use. With a telescope, this is most often used outside, so I believe, it would have to have a sturdy tripod (at the very least). If possible, except for the camera itself, the mounts should be of metal. Again, for a first telescope (and for kids) set up should be hassle-free. At best, the first telescope should easily be operated so as to be able to see heavenly bodies near the earth. Other farther suns and stars may be located on more high-grade telescopes later as the facility of the kid to use one is honed. Remember, keep pace with your child. Make sure you give him something that he is able to learn rather than one that creates fear or frustration. That telescope you saw might seem to be a bargain but can your child handle it? Because you feel that teaching your child how to use a telescope would be a breeze, don’t rub it in if he isn’t showing any interest. Ask, don’t push. Having gone this far, you could be one of those lucky parents who found out their shared love to explore the skies with their child. And now, you have to decide which of the available child’s telescopes you are to pick as your kid’s first telescope. Read on to see which one you should pick. This is one of the best telescopes for kids. It comes with a full-sized tripod, a 6mm and 20mm eye-piece, 2 Barlow lenses, 1.5x erecting eyepiece, and 15x and 50x magnification. The 2 lenses provide a clear image which makes it an ideal starter telescope where kids can enjoy viewing the solar system and other stars. The product is specially designed for kids that are aged 6 years or more. 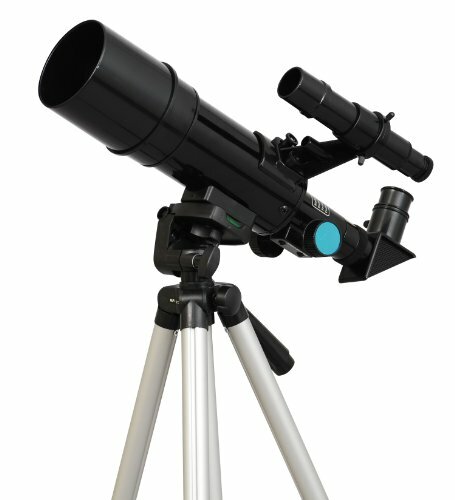 The good thing about the Black Twinstar Compact Kids Telescope it is lightweight and portable. This will make it easy for you and your kid to move it from one place to another. The telescope weighs about 4.1 lbs. Also, it is easy to assemble and you can complete the assembly process with a few minutes without requiring any special tool. Storage with also not be a problem as the telescope has a dimension of 23 x 9.3 x 4.5 inches. However, it is important to state that the telescope comes knocked-down but there are no assembly instructions which may make it complicated for some users. Also, the tripod is hollow and will fold with medium winds. The focus knob is not smooth and cannot be easily adjusted. Some buyers complained that the Black Twinstar Compact Kids Telescope is somewhat hard to focus. Others state that even though the tripod looks sturdy, it is actually flimsy and may be easily thrown to the ground. Also, the side-mounted viewing scope does not align with the telescope which may make it difficult for your little one to get a clear view. A few buyers stated that even though the tripod is flimsy, you can set it on a table. 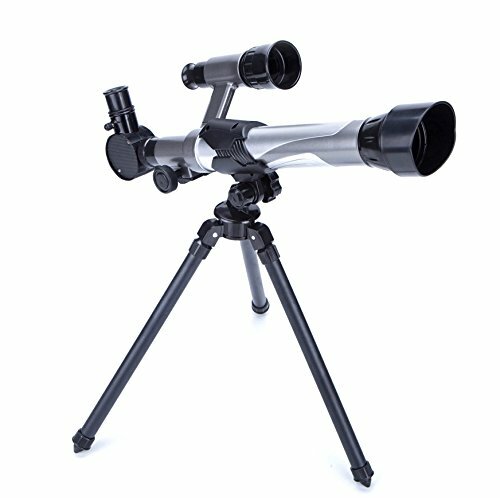 This is another amazing starter telescope on the market. Your little one will find this product fascinating as it is specifically designed to view and discover the moon, its area, and its craters. The Discover with Dr. Cool: Lunar Telescope comes with 2 lenses: the 18x magnification gives one a wide view of the moon while the 90x magnification gives you a close-up view of the moon with its craters. 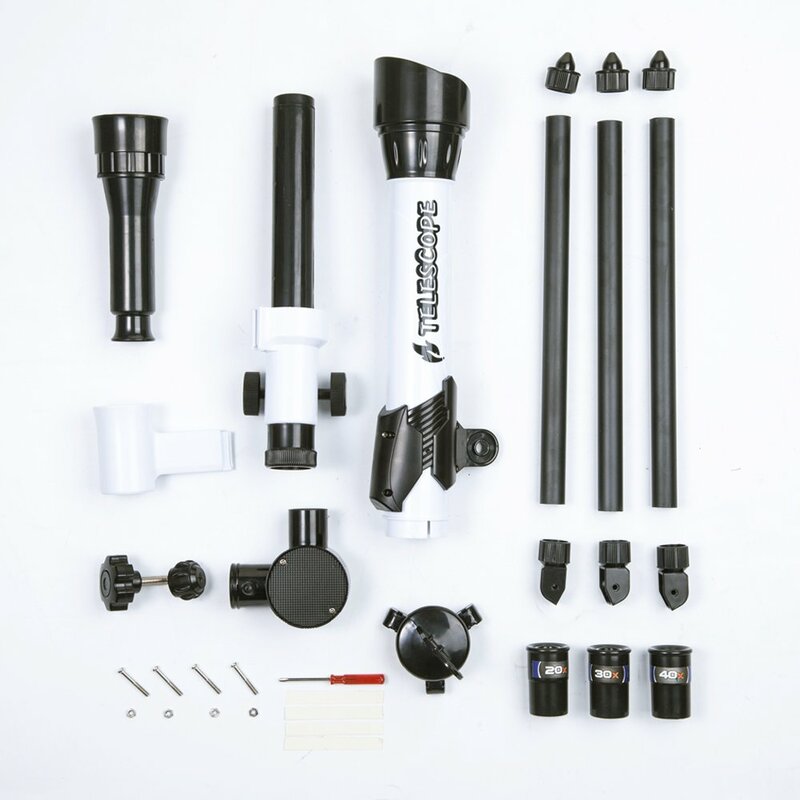 While the telescope is made from a top quality and durable plastic, the tripod is made of aluminum. The product is lightweight and can be easily moved from place to place even by your little one. It weighs about 2.35 lbs. Also, the tripod can be mounted on a table. If assemble is one of your worries, then you will not have issues with this product since it is easy to assemble. Storage with also not be a problem as the telescope has a dimension of 17.2 x 7.2 x 4.2 inches. Some buyers have complained that they can’t see anything through the eyepiece that is paired with the product. Others state that the telescope is really just a toy for kids and doesn’t work as claimed by the manufacturer. A meager number of customers state that looking through the lens of the Discover with Dr. Cool: Lunar Telescope, is just like taking a look with your naked eye. The Ya Bei Shangmao Telescope for Children is a popular product on the market. It is designed with top quality materials for entertaining you and your little one. It is a beginner’s telescope which makes it ideal for your little one. Kids will enjoy using this telescope bird-watching, mountain gazing, or skyline gazing for those high-rise city dwellers. This telescope is a good beginner scope which kids could learn to focus on objects. Furthermore, it is easy to set up and the process may only take a few minutes without requiring you to use any special tool or to employ the services of professionals. The product is lightweight and portable which invariably means moving it from place to place will not be an issue. It weighs about 1.55 lbs. Also, storage will be relatively easy with this telescope since it has a dimension of 19.7 x 9 x 3 inches. The Ya Bei Shangmao Telescope for Children is made of environmentally friendly plastic. It features 3 different magnification options including 20x, 30x, 40x. The objective lens diameter of the telescope is 60mm and the focal length is about 170mm. It also comes with a drawtube. The telescope allows for altitude-Azimuth mounting which provides you with an option to move it vertically or horizontally (360 degrees). However, it is important to state that the Ya Bei Shangmao Telescope is not designed for viewing the solar system. Also, the product is not as stable on the tripod. For this reason, it is advised to place it at the top of a flat surface for ease of use. Some buyers of the product have complained that the telescope is okay with viewing things that are far away but not fitted for stargazing. Others state that the product lightweight, which is a good thing since it allows it to be easily carried from one place to another but it causes the telescope to be unstable. Another user stated that it is acceptable as a starter telescope although it would not give a clear image of items in space. 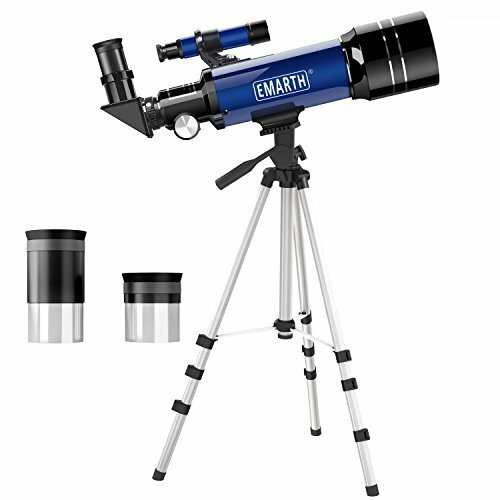 If you are looking to buy a high-performance product, with amazing features for a budget-friendly price, you should consider checking the Emarth Telescope out. This 70mm astronomical refracter telescope has a focal length of 360mm and a 70 mm aperture, fully coated optical glass to create stunning images, and interchangeable eyepieces. This is a good starter telescope for kids to explore the stars. The product is lightweight and portable which means it will be easy for you and your little one to carry it from one place to another. The Emarth Telescope weighs only about 2.87 lbs. It comes with an altazimuth mount feature as well as two different eyepieces – K6mm:60X; and K25mm:14.4X. Also, the telescope has a 5×24 finderscope paired with a mounting bracket. Furthermore, the Emarth Telescope comes with a 90°correct image prism diagonal. It also ships with a tripod made of aluminum with a height of 40cm. The product features a significantly high magnification and it is easy to assemble. It can be set up within a few minutes without the need to use any special tools. However, it is important to state that the Emarth Telescope may be a bit too complex for operation by young kids. There is some set-up to be done: may need the help of an adult. Also, your little one may find the height of the product too short. For this reason, it is advised that you mount the telescope on top of a table. The ToyerBee Telescope is another amazing product on the market. It is made with top quality and durable material to provide your little one with all the fun he may possibly desire from a telescope. The kid’s telescope has a focal adjuster with a focal length of 170 mm. It has three different Magnifications including 20 x, 30x, and 40x. Also, the objective diameter of the product is 60mm. The good thing about the telescope is that it gives the children a better perspective of their surroundings as they explore nature and the skies. It is made from a top quality plastic that will allow your little one to enjoy the product for a long period of time. The ToyerBee Telescope is lightweight and portable which invariably means moving it from place to place will be relatively easy. It weighs about 1.28 lbs. Furthermore, storage may not be an issue since the telescope has a diameter of about 17.3 x 8.2 x 3.1 inches. It features a draw tube. For ease of use, you may need to place the product on a table. It is designed to cater to the needs of children that are aged 8 years or more. Another advantage of the ToyerBee Telescope is that it is easy to set-up and you can complete the assembly process within a few minutes without the need to use any special tool. 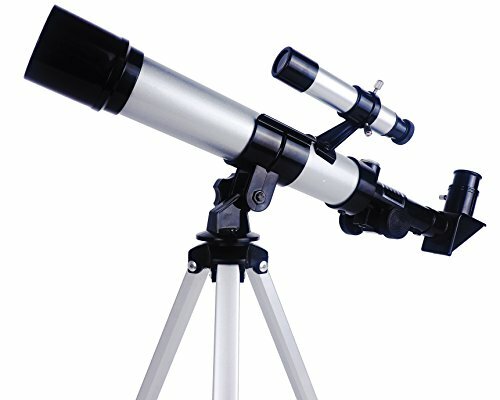 It is an ideal starter telescope as kids can focus easily as they develop more interest in things in space. Also, it has a budget-friendly price tag. However, it is important to state that the light weight makes the telescope sensitive to the slightest touch so it either loses its focus or is toppled down. Some buyers state that it is a good starter telescope that can create excitement for kids aged 7 but don’t expect to see much though. Another buyer stated that it is a small investment to whet children’s curiosity for outer space. A buyer complained that the ToyerBee Telescope does not ship with instructions and guidelines on how to set up which may make the process difficult. Another buyer stated that it is usually banged around or dropped. Notwithstanding, a buyer said the telescope is a very good distraction for her kid. 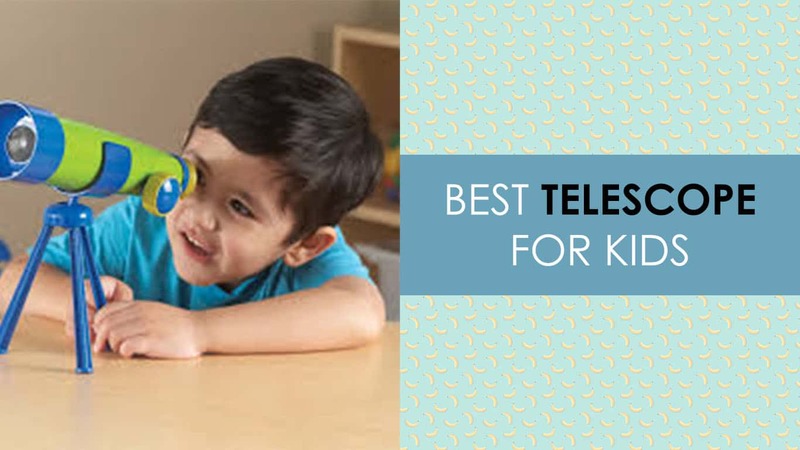 The ToyerBee Kids Telescope, DIY kids Telescope for Beginners is the last product on our list but not the one with the least features for your little one. This do-it-yourself telescope allows children to be hands-on doing simple projects, outcome of which he could later make use of. This will help build the confidence of the child and prepare him for more complex tasks. The ToyerBee DIY Kids Telescope is a good toy to encourage creativity for kids. Also, it offers a good value for money. It encourages interest in the kid’s surroundings. However, it is important to state that it may not be so powerful as to clearly see images in space. It comes with a tripod that is short so telescope and may need to be mounted on a table for easy use by your little one. Some buyers state that the tripod is flimsy and is easily knocked over. Others complain that the screws are a bit long and may have to be shortened so they don’t stick out. The telescope has the basic features to view objects. A buyer stated that it is a good toy that allows kids to be hands-on. Also, the DIY concept is a good learning experience for kids. 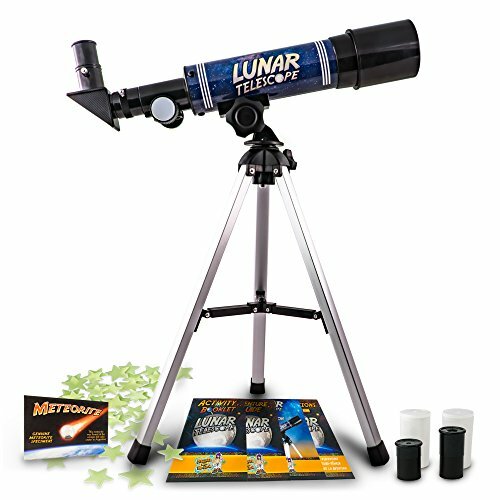 So what is the best telescope for kids? The DIY telescope enables kids to do simple projects by following instructions (e.g. setting-up of a telescope). Assembling the telescope develops creativity and it also gives the child appreciation of each of the different parts of the telescope. Your child learns on his own and this develops the child’s confidence. Having “built” the telescope on his own, he will be interested to “make it work” and discover new things operating the telescope. In addition, the whole process also develops the child’s patience. The DIY telescope may not be able to see through the stars but it is a good starter telescope that the child can learn to, operate and admire even just using it in his surroundings. Maybe, as the child has developed the skills on focusing, then it will be time to upgrade to one that can “see “ through the stars. Most parents would hope that their children would have a leaning towards the sciences and giving a telescope as a gift would really be great. However, parents should take note that the eventual user is the child and complex gifts as telescopes should be easily operable for them to appreciate it. Otherwise, you might just end up with an expensive telescope that sits on your storage cabinet because your child gave up on it as he is not able to understand how to use it. This was very evident with the customer reviews of all the 6 telescopes reviewed here. While parents rated some of the telescopes a low rate because it did not meet their expectations, the user or the child rated otherwise. It is because the children have discovered something that they haven’t seen before. Pre-empting this discovery stage by giving your kid a complex telescope at the onset may only dampen his appetite to learn if he is not able to understand the device’s operation. Remember: your child’s expectations and needs are different from yours.